The sentence was made in line with points c, d, clause 2, Article 257; clause 2, Article 258 and Article 50 of the 2015 Penal Code. 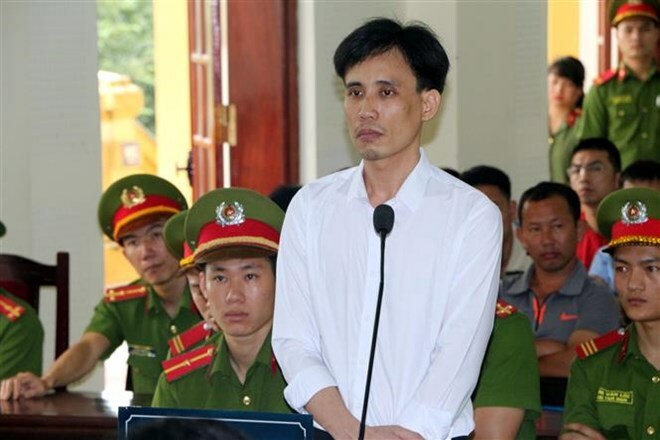 The jail term was counted from May 15, 2017 when Binh was put in temporary detention. Binh, born in 1983, residing in Hung Trung commune, Hung Nguyen district, Nghe An province, joined a number of organisations, associations and groups which oppose politics such as “NoU Saigon,” and “Phong trao Lao dong Viet” (Vietnam Workers’ Movement). He was arrested to serve investigations into his delivery of leaflets to incite people to join “Nghiep doan doc lap” (independent league), and received administrative punishment for his violation of regulations on keeping and distributing illegal publications and printed materials that are not publications. However, he refused to pay the fine and fled to Nghe An. After returning to Nghe An, Binh regularly posted and shared information and documents slandering the administration and advocating pluralism and multi-party movements via his Facebook account. On February 12, 2018, Binh filed an appeal against the decision of the People’s Court of Dien Chau district. According to Dien Chau district’s People’s Court, on the morning of February 14, 2017, Binh and another man named Nguyen Nam Phong, along with 300 people departed from Song Ngoc parish in Quynh Luu district to Ky Anh district of central Ha Tinh province on the pretext of lodging a complaint about Taiwanese Hung Nghiep Formosa Ha Tinh Steel Co. Ltd., which caused an environmental incident in four central province. With banners, the crowd travelled by different means of vehicles, causing traffic jams. He also called on Facebook users to keep track of, publish and share the comments to defame the administration and the police force. His acts have seriously affected the prestige, honour and interests of Nghe An police in particular and the people’s police force in general, stirring bad opinions both at home and abroad.